As construction of the new Memorial Causeway Bridge nears completion (top), Clearwater’s downtown revivalists accelerate the city’s ongoing make-over in 2004. 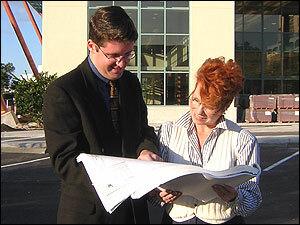 Above: Looking over final-phase construction plans for the elaborately-restored Main Public Library are the library’s Executive Director John Szabo and Laurel Gustafson. 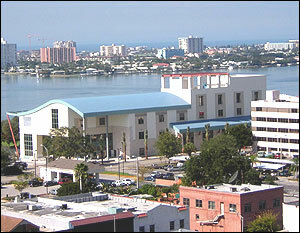 Below: The new Main Branch of the Clearwater Public Library will offer dramatic views of the inter-coastal waterway. The rise and fall and rebirth of Key West’s Duval Street deliver an important lesson to all Clearwater residents working for a thriving, prosperous downtown Clearwater. Like most US cities in the 40’s and 50’s, Key West’s downtown shopping district thrived, and its heart was Duval Street. But like an arrow to that heart came the 1960’s and that new American phenomenon: the shopping mall. Searstown Center opened and, before long, retailers and shoppers migrated en masse to the swank mall, leaving Duvall Street a virtual wasteland, its deserted buildings boarded up and vacant — for decades. But what others gave up as a lost cause, entrepreneur Len Chetkin seized as an opportunity. “When we bought property on Duval Street our friends thought that we were nuts. Who would want to buy property there?” said Len Chetkin. That was over 20 years ago. Today those once-boarded storefronts are home to the popular clothing store chain Chicos and Fresh Produce, as well as Little Switzerland and other upscale retail shops. The warehouse that once served the Chetkins’ carpet company is now being renovated by the Key West Film Society into screening rooms, lounges and a café. “I now have the same feeling about Cleveland Street,” said Chetkin. Convinced downtown Clearwater has similar potential for a commercial and cultural renaissance, he and his wife, Emmy, recently bought property on Cleveland and Fort Harrison, with plans to renovate it to house a new business. Like others with kindred optimism, the Chetkins are among a growing number of entrepreneurs and developers who are bringing a vibrancy to downtown that the city has not seen since well before the mall years. It is a trend that, on one hand, takes us back to the convenience and charm of an earlier era, but on the other, is tailored to the growing needs of a diversity of Clearwater residents. As many here recall, there was a time not long ago when the commercial and cultural lifeblood of the Clearwater community flowed outward from downtown. That was where we went to do business, where we saw our insurance man, got an ice cream cone, shopped the department stores, bought our kids’ school clothes as fall drew near. Within easy reach were the movie theater and the hospital, the churches and the banks. The birth of suburbia changed all that here and across America. Clearwater, like the rest of the country, went through its own cycle of the migration of residents and businesses away from the downtown area and out to the “’burbs”. Downtown Clearwater, like other U.S. cities, slid into decline. But after several decades of suburban sprawl, the indoor shopping center and long commutes, “the times, they are a-changing.” National trends are returning the exiled to downtowns as venues of choice to live, work and shop. 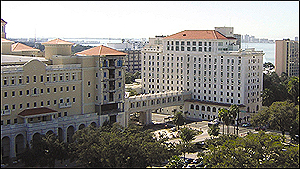 Clearwater is using this trend to her advantage, focusing on the redevelopment of the downtown core of the city. Reinforcing this migration back to downtown on a grassroots level is the national Main Street Program and our state Florida Main Street Program. These initiatives foster the use of both public and private funds to revitalize downtowns. Clearwater itself was officially proclaimed a Main Street community in 1998, and this August celebrated its fifth anniversary as such.